As Lent races toward me, thoughts tend to turn to the practical. How can I make sure that this Lent, services are the priority? How can I make sure that I can be both Mary and Martha, working towards inner calm while still getting the cooking, housecleaning and laundry completed? Being a planner, I find it helpful to have a plan! I know the first few years with children, I sort of floated through Lent, missing many services because I had little ones, no family nearby and a husband who was working 100 hours a week and was rarely able to attend with me. I certainly didn't think much about planning ahead for Lent. As a result, my focus was often wrong. I was concentrating on sewing the beautiful dress for my first little girl, frantically stitching on buttons moments before we walked out the door for the Pascal Liturgy, or I was focusing on the end of the fast and all of the food I needed to purchase. When my first 2 children reached the ages of 18 months and 3 1/2 years, I was about to give up even being in church for services at all. I am ever grateful for the kind father of older children who came to me one Lenten service as I was almost in tears. He always stood near one of the exits, and as I turned in exhaustion to take my restless and noisy toddlers out of the liturgy I shrugged and whispered that I wasn't sure why I even bothered to come. He hugged me, and took my 3 year old son in his arms and whispered, "because it is worth it." He encouraged me to slow down, to keep trying, to not give up, and to "pray with my feet" as Mat. Anna says. I realized that I needed to focus more on just being present, and make the most of that time. As I had more children, and they now grow older, the struggle changes. It seems like there is so much to do, as well as so many other activities going on in the spring - piano recitals, soccer games, karate tournaments, the need to swap out clothing for a new season, the pressure to begin thinking about the next school year. Then, a few years ago, I really began to see how I had been looking at it all wrong. I was always trying to figure out how to fit the services into our life - working around naps, feedings, work schedules, outside commitments etc. I finally realized that until I made the church our first priority, there was always going to be a good reason why I couldn't make a service. No question there are seasons in life when we are more fully able to enter into the life of the church, and others where we spend more time praying with our feet in the narthex or at home, but often I look back and realize that many times I could have been more present, had my priorities been better organized. For me, the way to flip that mind set was to become proactive, and schedule life differently. Now, the first thing I do when I get our schedule of Lenten services is to copy them onto my calendar. I admit, I am behind the times, I actually still have a giant paper desk calendar which hangs on my refrigerator and I love it! I also have a special schedule for Holy Week which I have shared in the past. That page hangs on my refrigerator as well. This schedule lists the services for the week, as well as all of those little things which are so easy to forget - flowers on Friday morning to decorate the bier, baskets full of rose petals on Friday night for the girls to spread around the tomb, bread and wine ready for Saturday morning. Having one place where all of those things are gives me a great deal of peace. Another thing I find is that it is terribly easy to lose my temper in that 30 minutes before leaving for a service (it is just me, or is this the time children choose to lose shoes and coats, have a dirty a diaper or temper tantrum?) How many times I find myself ready to yell at them to get in the car so we can go to church! One way to help avoid that is a little planning as well. I may take it to the extreme, but during Lent, I try to separate out the easy, seasonally appropriate church clothing for my kids and streamline their clothing. They typically wear the same pair of boots (until we can break out the sandals! ), and rotate through a handful of dresses throughout the week. 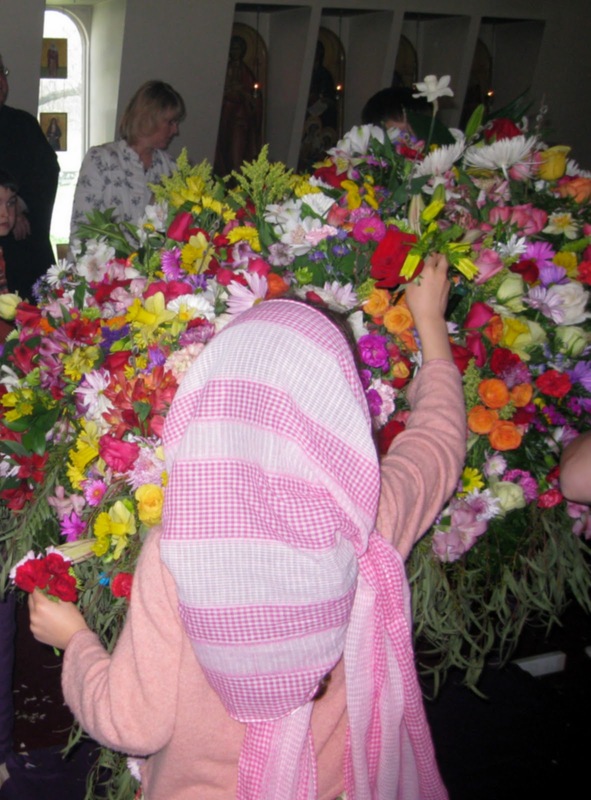 Before Lazarus Saturday arrives, I try to gather all of the kids clothes for Palm Sunday, Holy Friday, Pascha and Agape Vespers. My dining room table becomes command central for Holy Week, where I gather baskets for egg hunts, clothes, flowers, everything I can to have it easy to find. Knowing their clothes are all ironed and ready to go means I don't have to think about that during Holy Week. It also means I am not frantically trying to run a load of laundry because someone doesn't have clean underwear! Having young children means we always have distractions. But it doesn't mean these distractions have to consume us. With a little preparation, it is possible to avoid becoming consumed with the details by planning ahead for them as much as possible, and then, learning to be flexible when it doesn't all go smoothly (ah, if only I could get that lesson internalized). The details, the material preparations, are important, but are NOT the one thing needful. Finally, a quote I put up last year, which I think says it all far better than I ever could. 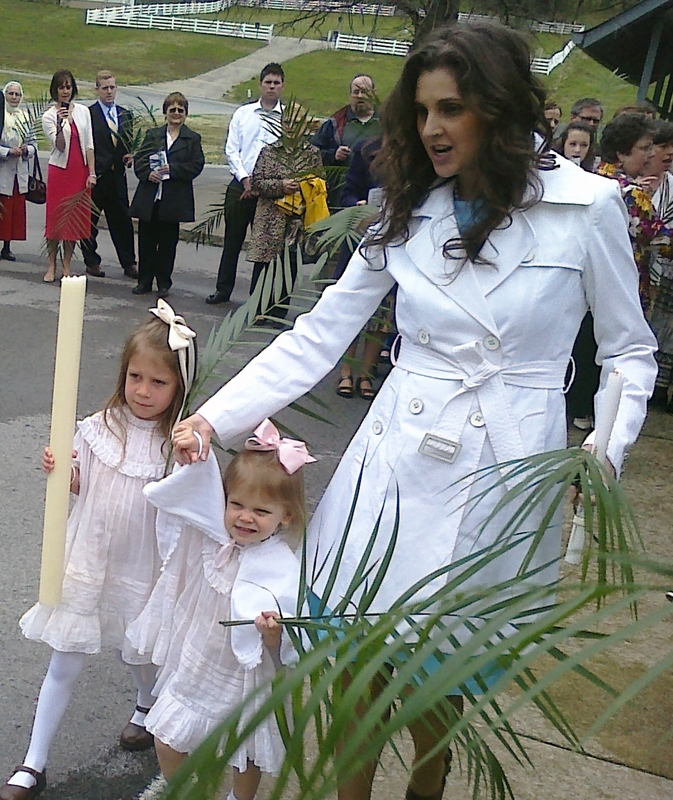 "After the Easter service, the blessing of the eggs, meats , breads, cakes, etc., which are proper to this feast takes place in Orthodox parishes. The custom, in itself, is excellent. It associates the life of the home with the life of the Church. 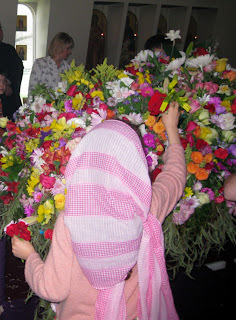 But one cannot protest too much against the deviation which it causes in certain Orthodox countries where many of the faithful are so absorbed with cleaning their houses, the decoration of eggs, the making of cakes, in short, with the material preparations for the feast, that they miss the services. Religion thus becomes an adopted national or familial custom which is no longer animated by the breath of the Spirit." Do you have any ideas that help you make Lent and Holy Week a time of peace rather than one of stress and busyness? Thank you for your honesty! It is so nice to see that I'm not the "only one" who wonders how we can pull it all off with my little ones. I am with you on the planning. Today my goal is to finish grocery shopping (10 cans of refried beans, anyone?) and put the services on our calendar. I also agree that on the days when we are going to church at night, the entire day is focused on making it out the door peaceful and on time. Anna, Thank you again for such a great post. It sounds like our home exactly with our brood of four... we try to work frantically around the church services and preparations for those services but like our regular Sundays, can still find ourselves 'losing it' those last 30 minutes. I do have to say that having their clothes clean and ready and socks in shoes (at the door) have been a tremendous help. Marking the paper calendar (there's nothing like it) with those special details not to forget such as lantern, flowers etc. are also a big help, the older ones are able to get those items and have them ready to go out the door with- one thing I continue to try to remember and find helpful is that asking for help usually resolves with getting help and the kids really enjoy being apart of everything- and not carrying it all on ourselves (that sense of self-achievement should be shared). I love that I can come here, relate and continue to find helpful reminders. Thanks again. I am jumping over from Ann's blog and also have seen your posts on evlogia, one of my favorite. Your blog is beautiful and inspiring and I love learning about the Orthodox Faith. I also enjoy reading about the little ones since most of mine are fully grown except for my 6 yr. old. It goes so fast and I long for those days. Have a blessed Lent. I will be back to visit. And yes – it is worth it isn’t it? But each service is an act of combat bravery – and I think – that you should think – that God thinks of it as honorable service to him and a sweet sacrifice to him – and he smiles. The more I read you, the more I know why I heart your words. This is such a fantastic post! Thank you so much for sharing your experiences and insights with us. As a mother with three young ones and another due right after Pascha, I need all the help I can get. Thank you!